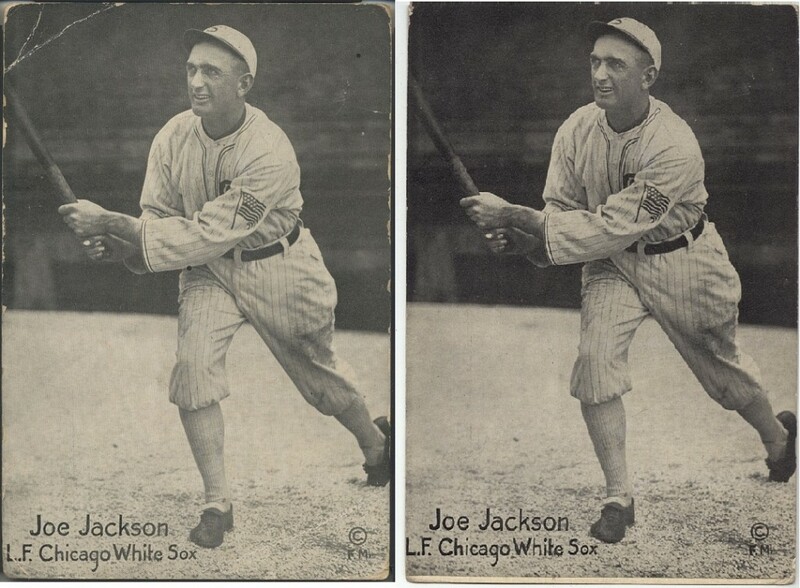 Goldin Auctions said this rare card of "Shoeless" Joe Jackson is the only one known, but veteran collectors disagree. The auction catalog description says it’s an SGC 20 “One of One” 1917-20 M101-6 Felix Mendelsohn Joe Jackson exhibit card graded Fair 1.5. All of that information is totally accurate. It’s the only such card ever graded by SGC and auctioneer Ken Goldin says that PSA’s Joe Orlando verified that his company has never graded or encapsulated an example of the rarity. The bid on the rare card at the Goldin Auctions website currently stands at $32,157. When veteran collector Dennis Goldstein saw Goldin’s press release revealing the card back in September he was surprised to hear him claim the card was unique considering that he had owned another copy of the same card and sold it in a major auction at Lelands in November of 1994. 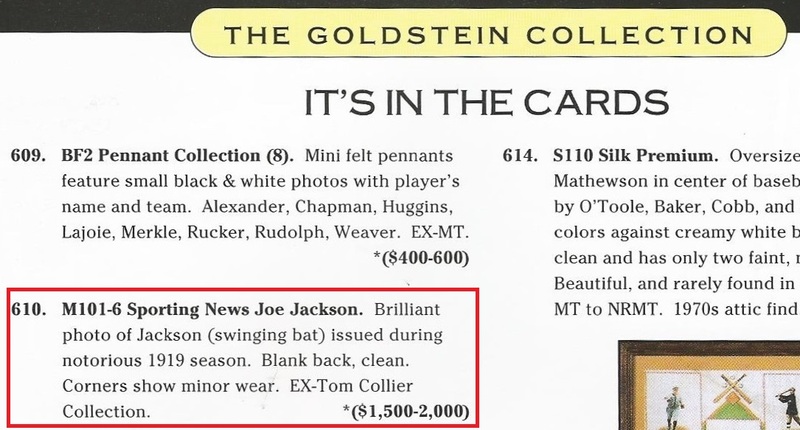 Josh Evans offered the card as part of “The Goldstein Collection” and it appeared as lot 610 in the sale listed as an”M101-6 Sporting News Joe Jackson” card indicating its “clean corners” and “minor wear.” The card’s provenance was attributed to veteran collector Tom Collier, one of the founders of TCMA. Back in 1994, the M 101-6 Mendelsohn set was incorrectly identified as a “Sporting News” issue. That being said, the Lelands listing establishes that at least one other rare Jackson card has been sold and was part of a prominent collection. 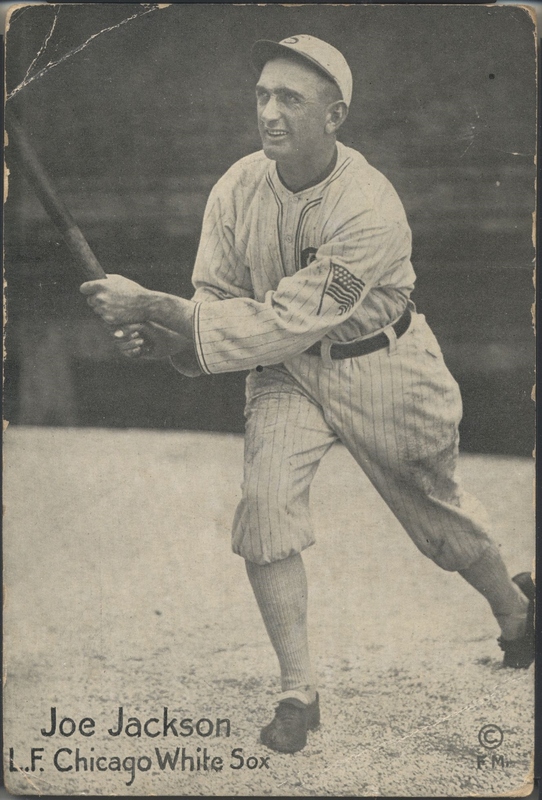 The card’s previous owner, Dennis Goldstein, is known to have one of the finest collections in the world and in the past has been a contributor to numerous research projects including the Ken Burns BASEBALL documentary on PBS. Lelands' 1994 catalog featuring the Goldstein Collection included the sale of another copy of the M101-6 Joe Jackson card. Hauls of Shame reached out to Goldin earlier this week and informed him that another card sold in 1994 and also told him of another M101-6 Jackson owned by another collector. Goldin stated he had been contacted by Goldstein but said he did not provide him with a photograph of his card. Goldin also told Hauls of Shame he called Mike Heffner of Lelands but he couldn’t recall the sale of the card. Lelands Chairman Josh Evans was unavailable for comment. 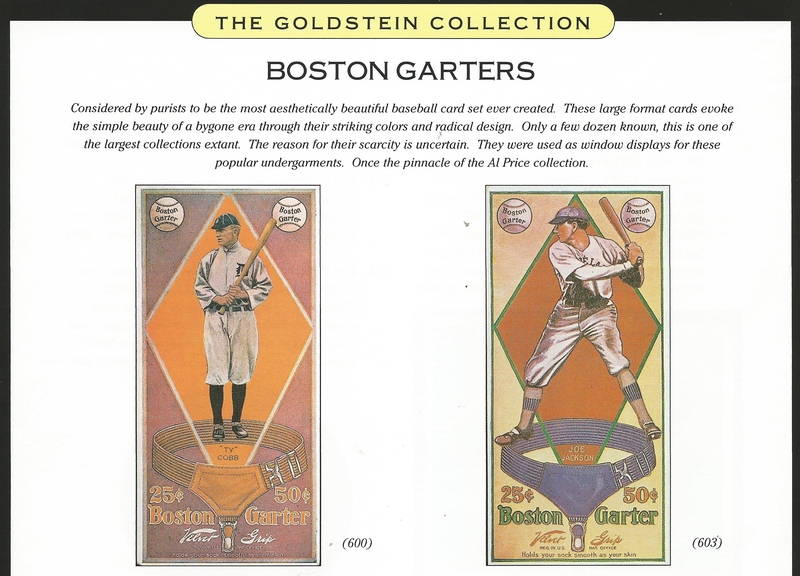 Goldstein said he gave Goldin the sale date, lot number, description and sale price of his card but did not send him a scan of the actual Lelands catalog description. After Ken Goldin was told about the Lelands sale of another Jackson Mendelson card he continued to promote it on Twitter and in the press as being the only known example. Goldin’s amended description, however, still failed to disclose the details of the Lelands sale specifically and actually stated that he had not been presented with evidence supporting the existence of the second card. In fact, Goldin continued to selectively post information in his possession as he had also been informed that the card had sold for $1,900 in 1994. Goldin’s editing on the lot description also includes no highlighting or alerts to bidders that the description has been amended. Another ultra-rare Joe Jackson card appeared in the same 1994 Lelands auction as a consignment from Dennis Goldstein who had collected the largest group of Boston Garters known at that time. 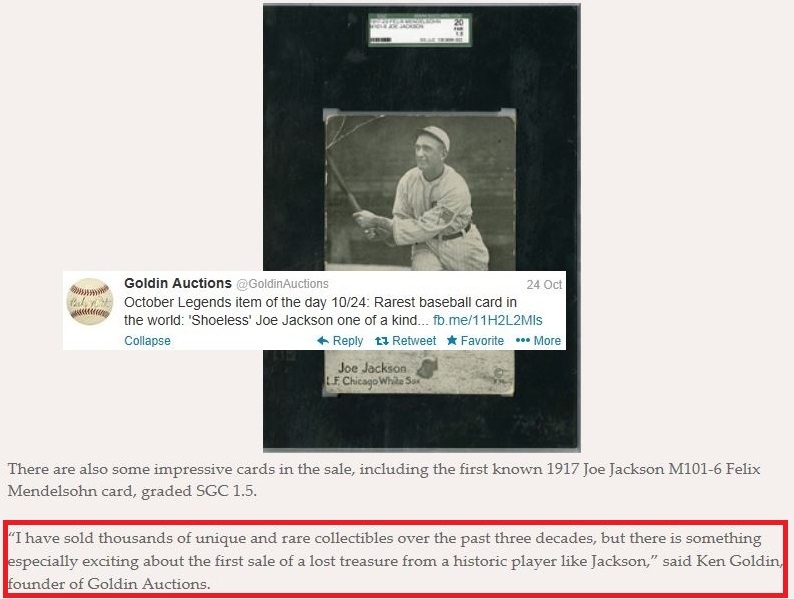 While Goldin's auction description states the Jackson image is "never before seen" the same image has been showcased on BlackBetsy.com since at least Feb. 2003 as captured on the Internet Wayback Machine screen-shot. In addition Goldin’s claims that the image itself represented on the card is “an image never before seen” is also inaccurate. The exact same image has been showcased on Mike Nola’s popular Joe Jackson tribute website, BlackBetsy.com, for close to a decade dating back to 2003. By late afternoon on Wednesday October 30, Goldin further edited his addendum to remove the terms “any evidence”; “first known example” and “only documented example” from the lot description, but chose not to identify Lelands auction house and the $1,900 sale of Goldstein’s example of the card. Goldin also changed the phrase, “never before seen photographic image” to “never before published photographic image,” which is inaccurate since the image has been published on the Internet since 2003. Goldin also chose not highlight the changes or note at the beginning or end of the lot description that the information was edited to acknowledge his card is not the first known example and not the only existing copy. Earlier this afternoon Hauls of Shame Tweeted an image of the 1994 Lelands auction page showing the sale of Goldstein’s card so that interested bidders would be fully informed about the actual population of Jackson Mendelsohn cards. In response, Goldin Auctions proceeded to block the Hauls of Shame account on Twitter. There’s no doubt that Goldin’s offered card of Jackson is a rare and important example from a very scarce set, its just not the rarest of all cards and not the only known copy of Jackson’s. Along with the handful of 1914 Boston Garter Jackson cards, the three documented Jackson Mendelsohn cards (and two others not yet verified at the time this article was published) should be considered the rarest cards depicting “Shoeless Joe.” In comparison, the famous Honus Wagner card, considered a rarity for many years by collectors far outnumbers these two Jackson issues. Hauls of Shame has documented 59 images of existing Wagner cards and verified three others to put the total population of Wagner cards at 62 examples (there are surely other Wagners out there that will likely be added in the future). Auctioneer Ken Goldin has been very proactive when it comes to editing or removing problematic lots from his auctions including items from the Barry Halper Collection and a pair of forged boxing gloves attributed to Rocky Marciano. While he accommodated some of the requests made to correct inaccuracies in his description after over-exaggerating the rarity of his lot, he decided to hold back the details of the 1994 auction and the claims that other cards also existed. It will be up to card collectors to determine if he went far enough or if he’s just another auctioneer long on hyperbole and short on full disclosure to his clients. The Joe Jackson M101-6 that sold at Goldin Auctions (left) is joined by a second copy of the Mendelsohn issue in superior condition (right). It is amazing how people lie about certain things like this, when it has been proven that they are wrong.The drama just goes on and on with these fools. Getting reports of more M101-6 Jackson cards, will post the images when we receive them. Looks like he fell victim to the classic play of exaggeration and overselling a card he did not do enough research on. It happens with a lot of auction houses. Giving too much of the benefit of the doubt to an item when they should have played it a little more conservatively. If it is a never before seen image, they need to make sure it is a never before seen image. Most importantly when information comes out that there are more of them out there, they need to fix the description in a more profound way to let people know. It’s called doing the right thing. Is this the same Ken Goldin? Back in the days of Don West, the crazy guy who would try and sell late night sports cards, Ken Goldin, owner of Goldins collectables would call in and add to the crazyiness. I used to love to watch the show, but I knew something was fishey with the whole operation. If you guys don’t know who Don West is, http://www.donwest.org/ has all the info you need about this great man. There show eventually died, and now Ken Goldin has his own late night show at 1am here on ABC family. Anyway, while channel surfing tonight, I see Ken Goldin on HSN and I am like WTF. Now his look has changed and he has toned down his whole “act”. I remember reading that Ken Goldin is a scammer, and dug this up on google.